On our first cruise in 2007, we discovered cruising is the best, most comfortable method of vacation travel. Our ship was a 4-5 star “floating hotel” taking us to see the world! In the last ten years we’ve spent 531 days on cruise ships and loved every minute of it!!! The only thing missing, and hard to find, is detailed information on where the cruise ship docks, location of tourist sites, information on public transit, walking tour maps, etc. to plan my shore excursions. Lacking this information, I’m "held hostage" to the ship's excursion bus as my only shore excursion option. I hate riding on buses. Detailed information on the port of call is key to finding and choosing the “best” shore excursion for my priorities. The “best” tour method depends on the port. Some ports are ideal for a walking tour. Others are better suited for touring via public transit, a HopOn bus, renting a car, hiring a private company to tour in a van (one of my favorites), or using the ship's bus tour. Ports are all different, so I need specific information for each port of call to plan my shore excursions. I began researching ports and writing guides with the detailed, comprehensive information I need to plan shore excursions. I shared my first guides with a few friends. They encouraged me to make the guides broadly available, suggested improvements, and helped me on my never-ending quest to create the "ultimate" cruise port and travel guide. Since 2008, I’ve published 73 guides with 1898 pages, 1798 photos, and 933 maps. I make my own maps. As I did research for the guides, I discovered 10 recurring questions about ports. When I could answer the 10 questions, I knew enough about the port to write the guide. Below, is my list of the 10 questions with examples of how I answer them in my guides. These questions should help you research ports. I hope my guides and website help you plan a great cruise vacation. 1) Where is the cruise port? 2) Where does the ship or ship’s tender dock? 3) If there is a shuttle bus from the ship, where does it drop me in the city? 4) What are the top tourist attractions and things to see and do from the port? 5) Can I walk to the tourist sites or do I need transportation? 6) Can the major tourist attractions be reached by public transportation? 7) Where can I find maps for public transit bus, metro, train, & HopOn buses? 8) Is a rental car an option to tour the area? 9) Does a walking tour involve steeply inclined, difficult to walk streets, and/or climbing stairs? Where are the elevators, funiculars, and buses to avoid walking up steep streets and stairs? 10) How much time do I have for my shore excursion? 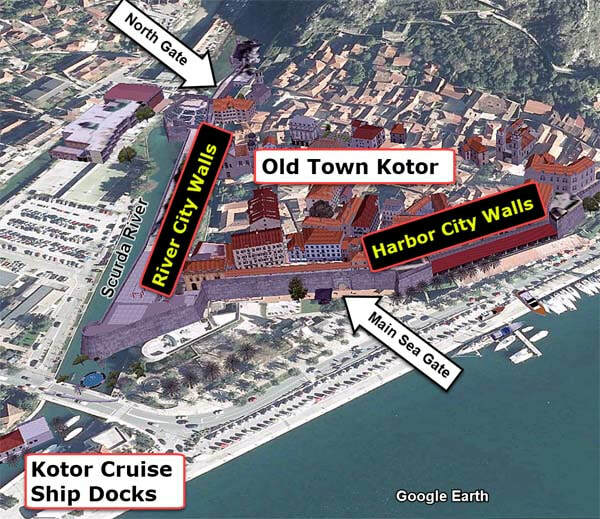 ​Example: My Kotor Montenegro guide shows the location of Kotor (map below) and the cruise ship docks next to the walled Old Town Kotor (aerial map at right). Cruise ships also anchor in the harbor and tender passengers ashore next to the docks. Example: In Santorini Greece, the tenders dock next to a 700 foot cliff. 3) Ride a donkey (5 euro) to the top of the cliff on the zig-zag path to Fira (Thira). There's also a speed boat excursion tour from the tender dock that takes you to the north end of the island at Ormos Ammoudiou. From the speed boat dock, you ride a bus up the switchback road to Oia, the most popular tourist site in Santorini. After your self-guided walking tour of Oia, the bus brings you back to Fira where you ride the cable car, a donkey, or walk down to the tender dock to return to your ship. Rental Car Touring: Santorini is a small island measuring about 10 miles by 6 miles. I believe renting a car is one of the best ways to tour the island. My guide includes details for renting a car with maps, GPS coordinates, photos, and a driving tour route to explore the island from Oia at the north, to Fira the Capital city, to Pyrgos Kallistis a beautiful village, to Perissa, the black, volcanic beach at the southern end the island. Sharon Sumliner sailing on the "Dream Catcher", a 62-foot sailing catamaran with room for 36 passengers. Check out the 27-page Santorini Guide as an example of the detail included in my cruise port guides. 3) If there is a shuttle bus from the ship’s dock, where does it drop me in the city? In some ports, cruise ships dock near cargo ships where containers and industrial products are moved. It’s dangerous to walk in these areas. Hence, the port, or the cruise ship, provides free shuttle buses between the cruise ship and the Port Exit. Bergen Norway has two dock areas (map below). The main docks are for cruise ships. You can walk thru this dock area. The commercial docks are unsafe for pedestrians due to movement of cargo. So the port provides free shuttle buses to the port exit shown as # 8 on the Bergen Port Map below. There are also ports where the cruise ship offers a paid shuttle bus to center city. The 45-page Marseille Port Guide is packed with comprehensive coverage and detailed descriptions of all the tourist attractions and things to see and do from the port. You can’t visit all of the sites. Use the guide as a menu of places you can choose to visit. When a ship docks in a city, there are often tourist sites close to the dock. You can explore these sites on foot, but you’ll need transportation to sites outside the city. I make my own maps to highlight important locations. The map below is from my 39-page Azores Port Guide. Ships dock in Ponta Delgada city. My guide has detailed descriptions and photos of 23 tourist sites shown on the map as “A” through “W”. My map also shows ATM’s, taxi stands, and shopping centers. Note the map scale is 500 feet. ​6) Can the major tourist attractions be reached by public transportation? If the port is in a major city, public transit and all travel options will be available because cities have a network of transportation by public buses, metro, street cars, trains, taxis, car rental, airports, etc. to serve residents and visitors. Manhattan is in center city close to public buses, the metro, taxis, trains, etc. Brooklyn is in a remote, “empty warehouse” area with limited access to public transportation. Cape Liberty Port is in a remote area in Bayonne, New Jersey. The closest public transportation is the 34th Street Light Rail Station 2 miles from the dock. You have to “call ahead” to schedule a taxi from the rail station to the dock. If the city is an important tourist destination, it will, most likely, have HopOn buses and tractor pulled trains to tour the area. When HopOn buses are available, I include the route map in my guide. If the port is at a small town or in rural area, it’s unlikely it will have the amenities of the full service public transportation network in large cities. For example, Cruise ships tender passengers to a marina at Gaspé, Quebec Canada. The tender dock is in a low population density, rural area with very limited transportation facilities. The major tourist attractions are a long way from the marina. Gaspé is in a gorgeous area, but you must plan ahead and book the ship’s excursion or a private tour (in a school bus) before your cruise ship arrives. See my 24-page Gaspé, Quebec Canada guide. 7) Where can I find maps for public transit & HopOn Buses? My guides include maps for public transit. Here’s a map from my Rome Port Guide. In addition to well known tourist sites, my Rome Guide describes the “Keyhole”. It's a "secret treasure". ​The Rome Guide has two maps showing the Keyhole. The street map shows the T3 tram stops (above right). The other map (in the guide, but not shown here) is a public transit map showing bus and metro routes and stops near the Keyhole. In addition to the 56 page Rome Port Guide, I have a 16 page Civitavecchia Port Transfer Guide to Rome. This guide describes the complexities of travel from the crowded port to Rome airports or hotels. If your cruise ends in Rome, “Plan Ahead” for your transfer. When thousands of people are disembarking ships at Civitavecchia port, it’s difficult to find a taxi at the last minute. You may have a 4 to 6 hour wait for a taxi to Rome!!! All my guides include HopOn Bus maps and web-links to download them. HopOn Bus routes are designed to visit all the major tourist attractions in the area! Hence, the HopOn Bus map is one of the best maps you can find to plan your shore excursion. Whether or not you plan to use the HopOn bus, check the websites of the bus companies. Some of them publish FREE very legible, useful maps showing all the tourist sites in the city. ﻿8) Is a rental car an option to tour the area? Rental car touring is not for everyone and it’s not practical in many ports. The advantage of a rental car is that it allows you to personalize your tour spending time as you choose. If you’re traveling with kids or have four people to share the cost, rental car touring is a very low cost shore excursion (per person). I use rental cars to explore low population density rural areas, towns, mountains, forests, coastal areas, and the countryside from cruise ports. My rental car touring guides cover Cobh Ireland, Santorini Greece, and several Canadian ports e. g. Charlottetown Prince Edward Island, Sydney and Halifax Nova Scotia, St John New Brunswick, and Quebec City. The guides include GPS coordinates for the ship’s dock and all the important tourist sites. I carry my GPS with me or rent a GPS with the car. In a few minutes, I can program the GPS with the driving route. An advantage of GPS is that I always know where I am, the route to my next stop, and the time it will take to get back to the ship. I have also written a tutorial on use of GPS maps and devices for touring port areas. Here’s an overview map from my 30-page Cork, Cobh, Ringaskiddy Ireland Cruise Port Guide Part 2 of 2 showing the rental car driving tour route from Cobh to popular tourist sites along the beautiful southwest coast of Ireland. ​ Where are the elevators, funiculars, and buses to avoid walking up steep streets and stairs? Monte Carlo, Monaco poses challenges for the mobility impaired. I am sensitive to the problem because I have difficulty walking up steep streets and some of my friends are in wheelchairs. There is very little published information on location of the free elevators/lifts and escalators that are "hidden" inside buildings. The photo at left shows the tender dock and the entrance to the elevator in the parking garage. Take the elevator to the top of the sea wall and walk west toward Fort Antoine. The photo below shows the walking route as a dashed yellow line along the top of the sea wall. Continue walking along the sea wall until it ends next to the Oceanographic Museum. When you can see the Oceanographic Museum, there will be two doors to enter the parking garage. Enter the first door, photo below left. The elevator will be immediately in front of you. You will be at level -2 (minus 2). Take the elevator UP to level 0. When you exit the elevator you'll see an escalator going down. DO NOT take the escalator. Continue walking past all the shops to the end of the parking garage as shown by the arrow in the photo at right below. Take the elevator at the end of the building up to the top, street level. ​You will exit that elevator next to the entrance to the Oceanographic Museum. I highly recommend visiting the museum. When you are done touring the museum, you can walk along the street to the Cathedral and the Palace. You will find public buses in the area to visit other locations in Monte Carlo. My port guide includes bus routes and maps. 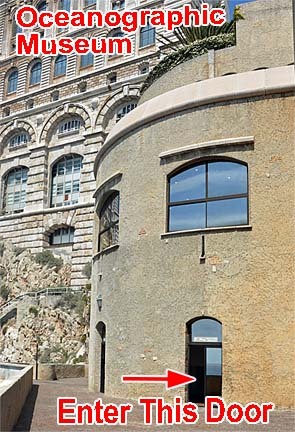 Using Toms Monte Carlo, Monaco Cruise Port Guide, my husband was able to ascend the Monte Carlo mountain in a wheelchair because Toms maps show elevator locations and a walking route from the dock that avoids stairs. 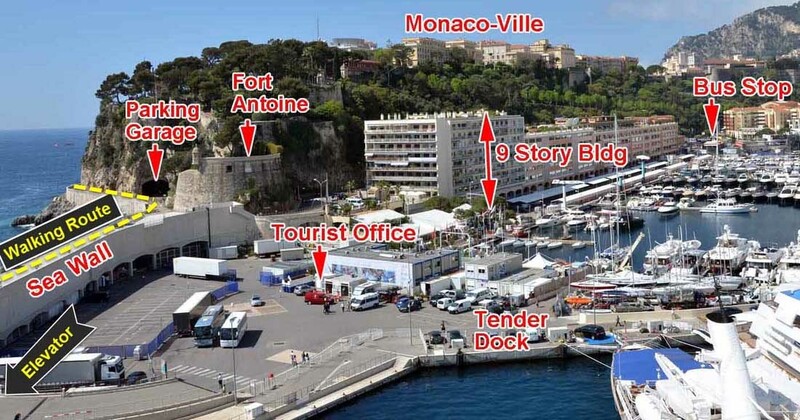 TESTIMONIAL: Monte Carlo Port Guide is on the mark! Cruise ships do NOT state how much time you have in port for a shore excursion. The ship’s itinerary lists the time the ship will be at the port e. g, 7 am arrival and 7 pm departure. You might think you have 12 hours for your shore excursion, but that’s not true! The ship needs at least an hour to dock, secure the lines, install the gangways plus clear customs and immigration before anyone can disembark. Also, ship’s have a “priority” regarding which passengers disembark first. People on the ship’s all day shore excursions disembark first. If tendering is required, it will waste a lot of time. Plan on a minimum of 30 to 60 minutes waiting in line and riding the tender to/from the shore. On one of our cruises, passengers were delayed almost 2 hours before they could go ashore. The tendering process is prone to delays and even cancellation. It's weather dependent. Wind, waves, and sea swells can slow down the process. It's unsafe to tender during fog. If your ship arrives at a port when there is fog, the captain will abort the port and sail on to another location. Tendering Safety Issues: There is risk of falling when stepping from the tender to the ship or vice-versa. Swells can cause the tender to move up-down abruptly. In Cann, France, the crew shouted and stopped me from stepping off the tender onto the floating dock at the ship. They saw a sea swell that caused the tender to rise abruptly. Had I stepped off the tender, it would have been ~ 3 feet down to the floating dock. I could have suffered a sprain or broken bone. Pay attention and follow the crew's instructions when tendering! ​If your ship arrives at 7 am and departs at 7 pm, assume you’ll have 9 or 10 hours for your shore excursion. If tendering is involved, assume your shore excursion will be 7 or 8 hours. Plan accordingly!!! When you have answered the ten questions above, you have the information you need to choose and plan your shore excursions. It’s important to accept the reality that you can’t do it all. Consider the time you need to visit each site and the travel time to get there. Also, you’ll need to decide on how you will travel. Use “Get Directions” to make you own walking/driving tour maps with distance and travel time for the sites you wish to visit. 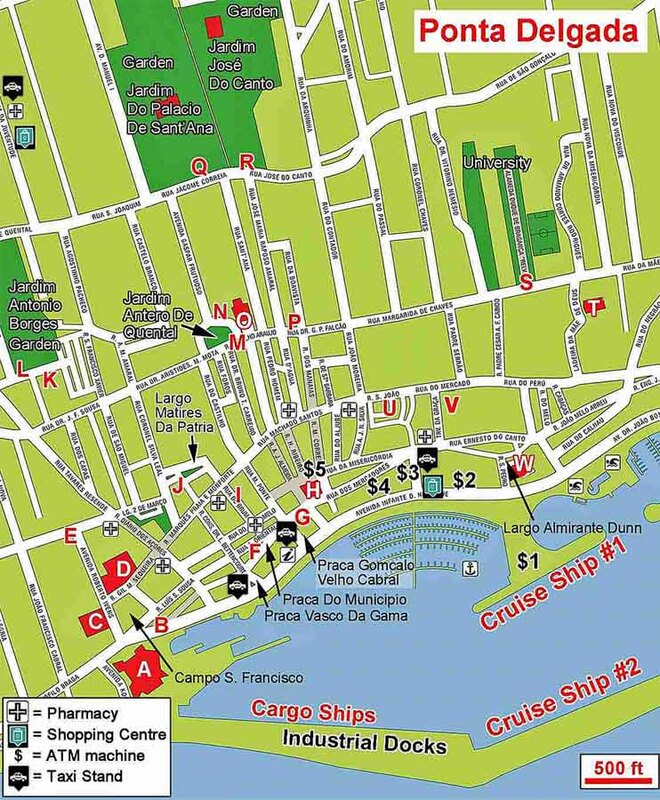 GPS coordinates are a powerful tool to explore the port from your home computer or tablet using Google Maps so that when you step off your cruise ship, the area will look familiar, as if "you had been there before." Port guides are designed to "jump start" cruise vacation planning by introducing you to the port area, touring options, and issues unique to the area. I include links to the best websites to save you Internet research time to find the information you want to plan shore excursions for your priorities. ​Port guides are pdf files (E-books). Download them to your portable electronic devices. Take the guides with you on your tablet or print a few pages to carry on your shore excursion. As an individual and for your personal, non-commercial use, you can take the guides apart. Otherwise, my copyright prohibits taking my guides apart. My goal is to provide the best, most useful, comprehensive information to familiarize you with a port area to help you plan shore excursions for your priorities and have a great cruise vacation. Before I discovered your wonderful, valuable port guides, we had booked tours that cost $1700. After reading and studying your literature, we cut out several excursions or booked what you suggested like the Florence Walking Tour instead of having a guide all day. Your advice has saved us a lot of money and we certainly appreciate it. In your honor I am going to donate $100 to the Salvation Army. I just completed Army Active Duty. My wife and I booked our first cruise throughout Europe. We searched the web for walking tours. Toms Cruise Port Guides are INCREDIBLE; the detail is amazing! You provide all information – maps, links, photos, everything needed to travel with more knowledge! I canceled ship's excursions at two ports and changed another excursion with great results. Your guides are accurate, complete, attractive, easy to follow and SO full of good information. I thank you for all your efforts to make them so useful to a long-time cruiser. It will make my visits easier. I can read pages in a Rick Steves' book ten times and not really "get the picture." I love how you provide the picture. Your format is amazingly clear. Love the maps, diagrams, arrows, and pictures. I am a professional instructional designer, and I am very impressed by your work and your ability to clearly communicate complex information. You saved us countless hours of continued internet searching and reading. We stopped searching when we found your website and amazing, very informative guides to plan our cruise. Thank you for your precious work. Your guides gave my vacation a special flavour. I want to thank you very much. My wife wants to thank you very much. My little children want to thank you very much and give a big caress to Teddy Bear. Cruising with little children is not easy. You can't improvise on a ship's excursion. Your guides helped me a lot. My wife and I just returned from a cruise where we used Toms Halifax Port Guide and Toms Saint John New Brunswick Port Guide. Had a great trip due to the use of your guides in both ports. You made selecting a rental car, destinations, and route selection as easy as could be. Your guides gave me confidence, along with my own GPS, as to where we were going and how long it would take. We never got lost. Can’t wait to travel somewhere else that you’ve been to and use your port guides. These are the best, most practical and usable travel helps I have ever seen. I've been associated with the the travel industry for almost 30 years (now retired). The pictures and maps make your guides come alive giving the reader all the tools needed to confidently explore important sites. You answer many questions for which I have been unable to find answers, like public transportation and local tour options. We prefer independent sightseeing; your guides are perfect for this. Having just returned from Portugal, Toms Lisbon Cruise Port Guide is spot on!!! All your guides are phenomenal. I can't even imagine the amount of time and effort you must put into each one. Well done. Just got back from a 38 day cruise. Your port guides were with me every step of the way. They're my #1 go to for info about the ports I'll be visiting. Please keep adding to the collection! There is nothing else out there that compares to the quality and breadth of the information you provide. I was happy to see your new guide for Kotor as it's one of the ports I'll be visiting next year. Thank you so much for this elaborately, intelligently, thoroughly well researched project/website, which will aid every traveler. The guides are large files requiring a fast, land-based internet connection (WiFi) for downloading. Most cruise ships use sloowww satellite based internet connection. Hence, you cannot download the guides from a ship. Go ashore to use fast WiFi or download the guides from home before your cruise. I have included "Tips on downloading the guides and placing them on your tablet's bookshelf." A photo tour of Panama Canal with maps, cruise options, and ports of call. Includes information on where to stand on the ship for the best photos, a description of partial Vs. full transit, a map of popular ports of call, a list/description of my guides, etc. An introduction to the Mediterranean ports of call with photos, maps, etc. This web-page highlights some of the most beautiful and memorable places to visit in the Mediterranean. It includes a map of popular ports of call, a list/description of my guides, etc. I believe Canada and New England is one of the best cruising areas in the world. All the ports are clean, safe, and each port is unique. This web-page explains why you should cruise this area, highlights the beauty, history, and uniqueness of these ports with a list/description of my guides. A cruise experience is totally different on sea days vs port days. Port days are hectic; sea days are relaxing. I’ve crossed the Atlantic 17 times on cruise ships. It’s my favorite cruise because it offers time to relax, meet people, renew acquaintances, and enjoy the amenities, entertainment, food, etc., on my 5-star, ship-hotel. On transatlantic cruises, ships usually stop at one or two islands such as the Azores or Maderia which are wonderful and memorable places to visit. See my port guides for these islands. No matter what your priorities and interests are, you’ll find cruise ships, cruise lines, and itineraries for your “perfect” vacation. It’s useful to define priorities for what you want on a cruise to find cruises that best cater to your needs and interests. 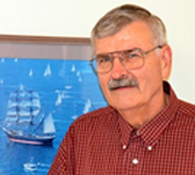 My criteria include: 1) a customer focused crew, 2) consistently, excellent service, food, and entertainment, 3) high ratings on Coast Guard and International ship inspections, and 4) a ship where the captain will change course and speed, to the extent possible, for the safety and comfort of passengers regardless of the amount of extra fuel consumption required $$$. Internet access and email on a cruise ship – how to dramatically reduce your internet minutes!! This web-page describes how to find locations on maps, why GPS coordinates are important, how to use Google street level photos to preview your tour, and how to create maps to use on your shore excursions. My background, interests, and the story of how and why I started writing guides. Please tell your friends and travel agents about my website and post a reference to it on the blogs. Most travelers haven't discovered my website. Information contained on my website and in my port guides is believed to be accurate. PLEASE verify the information you use for your travel plans. Opinions expressed are my own.